Most people do not want to go through a contested divorce. The process takes more time than expected and adds another layer of anxiety to an already tension-filled time. However, this type of divorce is often unavoidable. When it occurs, it is important to have an experienced divorce attorney who understands the issues involved and who knows the most effective ways to help clients get through the challenges of a contested divorce in Arizona. At our Scottsdale, Arizona law firm, the Law Office of Karen A. Schoenau, our dedicated family lawyer knows that every divorce is unique and that some divorces are more challenging than others. Attorney Karen Schoenau has more than three decades of family law experience that she uses to create strategies to protect the best interests of clients and their children, however strongly contested the matter. Clients rely on her skills and advice as they navigate the issues and roadblocks that often arise during a hard-fought divorce in Arizona. Legal decisions: Which of the parents is going to make legal decisions related to the children’s school, religious teachings, and general welfare? When parents cannot agree to make such decisions jointly, determining child custody can become difficult. Child support payments: Calculating the correct child support amount is often less straightforward than one might think. The state laws regarding child support include several ways that parents can deviate from the established formula, such as income disparity, differences in parenting time, education and childcare costs, and other factors. Division of property and debt: As a community property state, Arizona assumes that the spouses share property and debts acquired during a marriage equally. However, there are exceptions, such as property owned by one spouse before the marriage, gifts received by one spouse, and inheritances received by one spouse. These exceptions are frequently the basis for a contested divorce. Spousal maintenance: Spousal maintenance, also called alimony, is an area about which spouses frequently disagree. It is important to understand the factors that courts use when deciding about a spousal maintenance dispute. These include whether one spouse has the property and resources to be self-supporting, whether a spouse must provide full-time childcare that prohibits them from finding a job, whether one spouse is too old or lacking in work experience to realistically find a job, and whether one spouse paid for or supported the education of the other spouse. 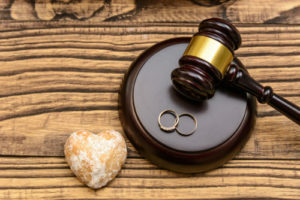 If what should have been a straightforward divorce becomes contested, it is important to consult an experienced Arizona family law attorney to determine how to proceed. Call contested divorce lawyer Karen Schoenau at 480-725-1438 or toll free at 888-304-0928. You can also contact us online.